Cycle Sport March is available in UK newsagents from Wednesday January 19, and it’s packed with the best writing and photography of professional cycling available, all for £4.25. 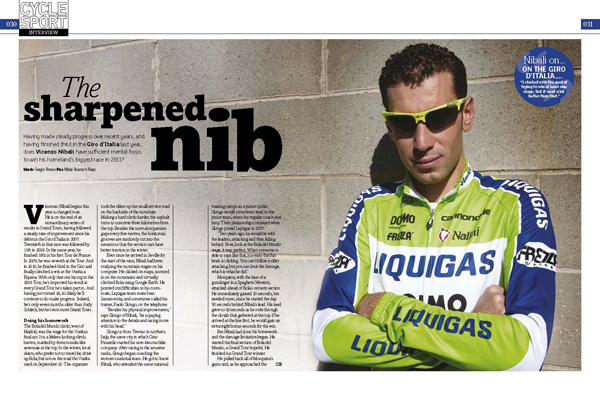 This month’s cover star is Vuelta a Espana champion Vincenzo Nibali who took time out at the recent Liquigas training camp to chat to Cycle Sport. The 26-year-old Italian’s career trajectory looks like a perfect straight line. He made his debut with Fassa Bortolo in 2005. In 2006 he won his first major race, the Grand Prix Plouay. In 2007 he started focusing on the Grand Tours, coming 19th in the Giro. The following year he was 11th in the same race, and 18th at the Tour. In 2009 he rose to seventh in the Tour. Third in last year’s Giro was followed by his win at the Vuelta. If you follow that line into the future, it’s just about possible to imagine a Giro d’Italia win a few months down the line. And what about a Tour de France win another year on? Nibali’s got a delicate situation in his team, sharing the Grand Tour leadership duties with Giro winner Ivan Basso. It looks as if Nibali will lead Liquigas at the Giro this year, and Basso the Tour. It’s not even out of the question for Nibali to defend his Vuelta crown. But with Nibali’s progress having been so spectacular, he’s going to want to lead the team at the Tour de France by next year at the latest. He tells writer Gregor Brown why he and Basso are so difference, about how he’s learned to think more on the bike and how he felt at being Italy’s first Vuelta winner for 20 years. We’ve interviewed the best rider in the world. 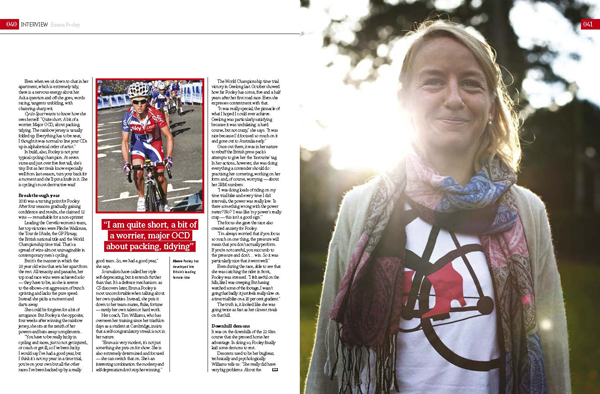 Emma Pooley won a major Tour, a Classic and a world time trial title in 2010 – no other rider can claim such a broad range of victories last season. Pooley’s a bit of a worrier, she informed us. She worries about attacking, not attacking, descending, training. When she’s cycling, she worries about not devoting enough time to her PhD. When she’s working on her PhD, she worries about not doing enough cycling. If she’s not worried, she worries that there’s nothing to worry about. In a frank and fascinating interview, she tells Cycle Sport’s Andy McGrath about her world time trial title and how she juggles elite sport with elite academia. Our conclusion: Pooley’s possibly the nicest person in sport – she apologised to Judith Arndt for beating her in the world time trial championships. There’s also a full 2011 season preview, featuring all the major teams and all the major races. From the rogues’ gallery of Vacansoleil to Europcar’s one-man band, from retro-chic HTC-Highroad to over-gaudy Lampre-ISD – we’ve analysed every team to within an inch of its life. You won’t find bland, boring predictions that may or may not be wrong, nor stunningly insightful observations about bike racers wanting to win bike races. You will find the most entertaining, well-researched team guide available. 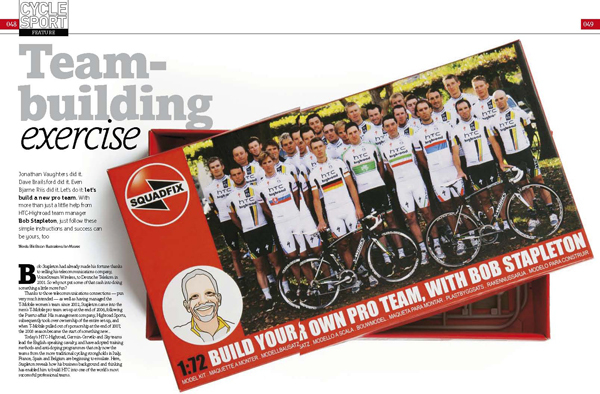 We’ve interviewed HTC-Highroad boss Bob Stapleton about how to build a professional cycling team. He’s broken this rather large task down into the most important seven concepts he applies to his work, and we’ve presented it as an easy-to-follow step-by-step guide, complete with illustrations and instructions. The Green Edge management will be following these closely. Cycle Sport has also gone behind the scenes at the HTC training camp in California, with a picture special looking at the work of both men’s and women’s teams as they are sized up by bike manufacturers Specialized. Liquigas have signed two young American riders for 2011, and we’ve got a double-header interview with Ted King and Timmy Duggan as each tells us about the other, while explaining how they are settling into one of cycling’s strongest teams. Iconic Places covers the Poggio, the crux of the opening Classic of the year, Milan-San Remo. The Poggio is not as steep, long, hard or beautiful as any of the other climbs we’ve ever featured, and for 364 days a year it is a quiet suburban drag. But on Classicissima day, it is one of the most intense spectator experiences in cycling. Its slopes have been consecrated by the greatest champions, from Eddy Merckx to Mark Cavendish. Plus…All our regular features – Shop Window, with extravagantly shiny bike bits; Graham Watson looks at some of the new team jerseys; Broomwagon – Cav asks Greipel for a competition at everything, a first look at the UCI-Approved bike stickers, plus we call Ricco a git; How team Leopard made Bjarne Riis popular in Denmark again; Q&A with Taylor Phinney; the top 10 cycling fans by nationality, and much much more, all for £4.25. 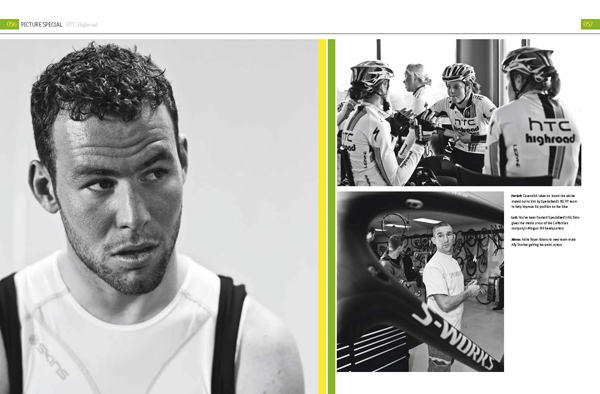 Cycle Sport March is on sale in the UK from Wednesday January 19, and will be available later in the US.